INCITE claimed a spot for themselves in Thrash/Groove scene back when they started in 2004, and haven’t stopped menacingly staring down anyone who even tries to come too close to their territory. Fifteen years and five full-length albums have led to the creation of their own special brew of Poser toxin, Built to Destroy. The demon seed of infamous metal legend Max Cavalera of SEPULTURA, vocalist and INCITE founder Richie Cavalera has forged his own blood-soaked sound of hatred. The opening title track sears a hole through itself from its own corrosive chords like battery acid. “Ruthless Ways” and “Backbone” brim with the violence of early SLIPKNOT. Featuring Contributions from CROWBAR’s Kirk Winstein on “Human Cancer” and legendary Chris Barnes from SIX FEET UNDER on “Poisoned by Power”, Built to Destroy has a lot of violence to deal its listeners. 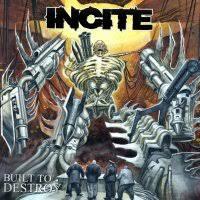 Ritchie himself has described INCITE’s sound as a punch to the face. The album title as well as the theme a reference to how we as a society are as destructive to ourselves as we are to others around us and how a responsibility check should be a priority. But, INCITE doesn’t want to lecture anybody. They prefer a more “hands-on” type of teaching, believing that the best way to teach a lesson is to drive a hammer of sonic rage directly into your face. On Built to Destroy there are a lot of songs that drown and stew in their own bitter hatred like “Confronting Darkness”, while some are instant anthems for circle pit warriors like “Cessation” and “Hate for Life”. Final track “Savior Self” is probably the most aggressive on the album, literally dissolving into nothing during the screaming outro. With brain-liquifying riffs that tower like destructive tidal waves before crashing down on your ears, Built to Destroy’s rage is tinged with fifteen years of experience.